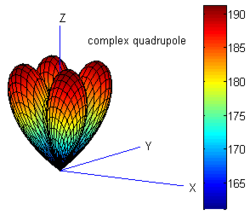 Project: "Theory and application of acoustic multipole radiators with complex singularities"
The aim of this project is to study and to clarify the mathematical and physical properties of complex multipole radiators. 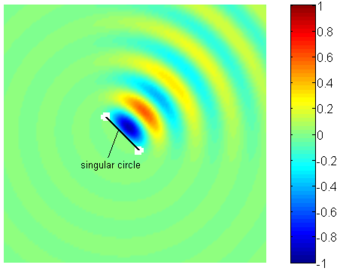 The source distributions that appear on the right side of the wave equation and produce single complex multipole radiators will be determined and the characteristic properties of the associated sound fields depending on the multipole order and position of the singularity in the complex plane will be investigated. 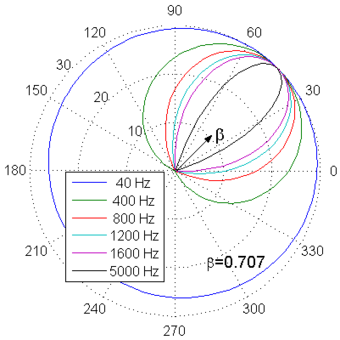 where A is the complex amplitude, x=(x1,x2,x3) the receiver position and k=w/c the wave number with the circular frequency w and the sound speed c.
The sound of a complex monopole is radiated mainly in a half space and concentrated in the paraxial region near the axis given by β, for kβ>1, contrary to the uniformly radiation in the whole space of the usual monopole. The singularity of this type of source does not lie on one point but on a circle of radius β, centered on the point y, that lie on the plane perpendicular to β. Figure 2. Radiation pressure of the complex monopole for different frequencies. Figure 3. 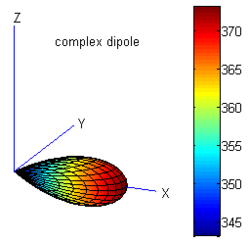 Radiation pattern of complex multipoles. plane, J. Acoust. Soc. Am. 116 (6), 3304-3311, 2004. Quellorten, Fortschritte der Akustik, DAGA 2006, Braunschweig, 2006. Vibration (ICSV13), Wien, Austria, 2006. Congress on Sound and Vibration (ICSV16), July 2009, Krakow, Poland, 2009.
plane, J. Acoust. Soc. Am. 133 (4), 1911-1921, 2013.